HomeblogWho blew up the rocket? Exactly what exploded in a ball of flame over Wallops Island, Virginia, on Tuesday October 28 at 6:22 pm? And what brought down Virgin Galactic’s SpaceShipTwo over the Mojave Desert Friday morning just after ten am? Was the vehicle that exploded above the launch pad in Virginia, as some headlines have proclaimed, a NASA rocket? Was it, as others have said, a commercial rocket? Or were both the rocket that exploded and the space plane that crashed a product of another sure-fire disaster-maker entirely: America’s space military industrial complex? And, just as important, were these accidents the product of that complex’s Senatorial and Congressional backers? You recall that in 1961, Dwight D. Eisenhower warned us against the military industrial complex of his day. Little did he realize it, but that complex was about to move into a brand new field: space. In the beginning, the presence of military industrial monoliths like Boeing, Grumman, North American Rockwell, McDonnell Douglas, and IBM would help us get to the Moon. They would help give us the 135 successful flights of the Space Shuttle. And two disastrous flights. Then they would kill our manned space program utterly. Yes, kill it. The monster companies of the space military industrial complex (the SMIC) would take us out of the race for manned space for a minimum of six years. And they would give us an exploded Antares with $200 million worth of cargo destroyed and a downed SpaceShipTwo. How and why? And what about the hidden questions the Antares rocket explosion and the SpaceShipTwo crash raise? How did the explosion we saw last Tuesday and the crash of last Friday represent a danger — not just to our space leadership but to the very safety of our military men and women, the troops we depend on to keep America out of harm’s way? 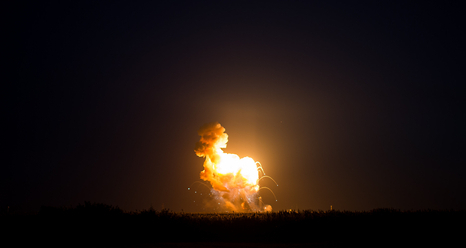 How do the Antares explosion and the SpaceShipTwo tragedy represent a danger to our nation itself? And where do inferior weapons, exorbitant prices, and Senators and Congressmen ravenous for campaign contributions come into the story? In Eisenhower’s day, there were enough companies in the military industrial complex to provide a modicum of competition. There were Boeing, General Dynamics, Lockheed Corporation, North American Aviation, United Aircraft, Douglas Aircraft, the Glenn L. Martin Company, the Hughes Aircraft Company, the Sperry Corporation, Raytheon, Northrup, and McDonnell Aircraft. Then those companies conglomerated. In 1967, McDonnell Aircraft and the Douglas Aircraft Company fused together as McDonnell-Douglas. Thirty years later, the McDonnell-Douglas agglomeration was swallowed by Boeing. In 1961 the Glenn L. Martin Company merged with the American-Marietta Corporation. In 1995, Martin Marietta, in turn, merged with Lockheed to become Lockheed Martin. And companies like Raytheon that had once been in the consumer electronics business opted out of the fierce competition of retail products — products that serve you and me — and sought richer profits in the military realm. Competition went down to nearly zero. Instead, the space military industrial complex companies pooled their piggy banks to fund organizations like the Coalition for Space Exploration, groups that would lobby for ever more pork. Profits are higher in the military business than in the consumer sector. Far higher. But why? Because military procurement uses a method called cost-plus. If I make a plane that costs me $100 million to produce, you, the military, will pay me $110 million for it and guarantee me a profit. If I manage to bulk the cost of that same plane up to $150 million, you’ll pay me $165 million and my profit will go up 30%. The more I drive up costs, the more greenbacks I rake in. Needless to say, under this system, the cost of all things military soars. And the quality and capability goes down. But quality and capability is a subject for later. One project, the F-35 fighter, provides jobs in an astounding 45 states. Senators and Congressmen defend a project like that whether it is needed or not. Whether it is capable or not. And whether it is high quality or not. In 2011, Congress, the Senate, and NASA grounded the Space Shuttle. That left us with a vastly underpublicized crisis. Without the Shuttle, America, which had long been the world leader in space, had no way to get American citizens to orbit on American vehicles. We’d paid the bulk of the $100 billion to build and maintain a structure more audacious than the pyramids, the International Space Station. But we couldn’t reach it. The Chinese could put humans in space. We could not. What did we do? We turned to the Russians. For three years, Americans and their experiments and supplies have been traveling to space on Russian vehicles—the Soyuz and the Progress. Why? It was a hideously expensive program that looked exactly like the Apollo Program, but bulked up in size. It had 38-story-tall rockets and capsules that looked precisely like the one in which Neil Armstrong and Buzz Aldrin had splashed down on the way back from the Moon in 1969. But bigger. The Constellation program was hideously expensive because it relied on the space military industrial complex, the legacy space companies: Lockheed-Martin and Boeing. And those companies were less interested in getting humans into space than they were in maximizing profit. Despite Augustine’s background as one of the space military industrial complex’s highest-placed leaders, his committee came to a simple conclusion—the Constellation program cost far too much for far too little. It would stall out before it could be completed because it would cost more than America could afford. So the Obama administration tried to kill it. To replace Constellation, the White House favored buying space services from the lean, mean entrepreneurs of the silicon age, folks like SpaceX’s Elon Musk. But the cabal of Congressmen and Senators assembled by the space military industrial complex were having none of it. They’d become addicted to space pork. And to the steady stream of campaign contributions the space military industrial companies poured into their coffers. These senatorial and congressional figures cobbled together a Frankenrocket made of old Constellation parts, space military industrial company parts, and called it the Space Launch System. NASA did not want the resulting monster rocket. But the Senatorial and Congressional cabal shoved it down NASA’s throat. And the Frankenrocket swallowed nearly every penny that NASA had for manned space. But the monster rocket–the Space Launch System–did more. It guaranteed that America would NOT have access to space on American rockets. How? 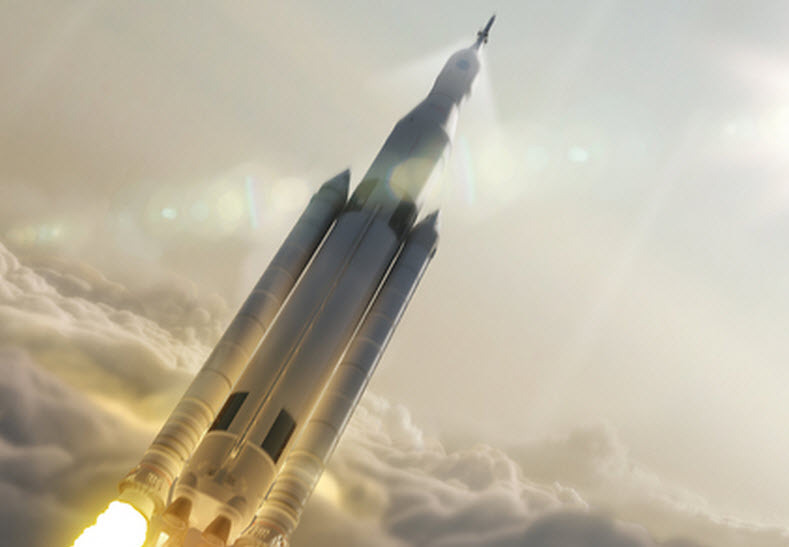 The Space Launch System, said even its supporters, would not be able to carry humans into space until 2022 at the earliest. In other words, every Congressional and Senatorial bit of arm-twisting on behalf of the SLS ensured that America’s space gap would last eleven years. At the very least. Meanwhile, a group of stalwarts tried to find a way out of this bind. 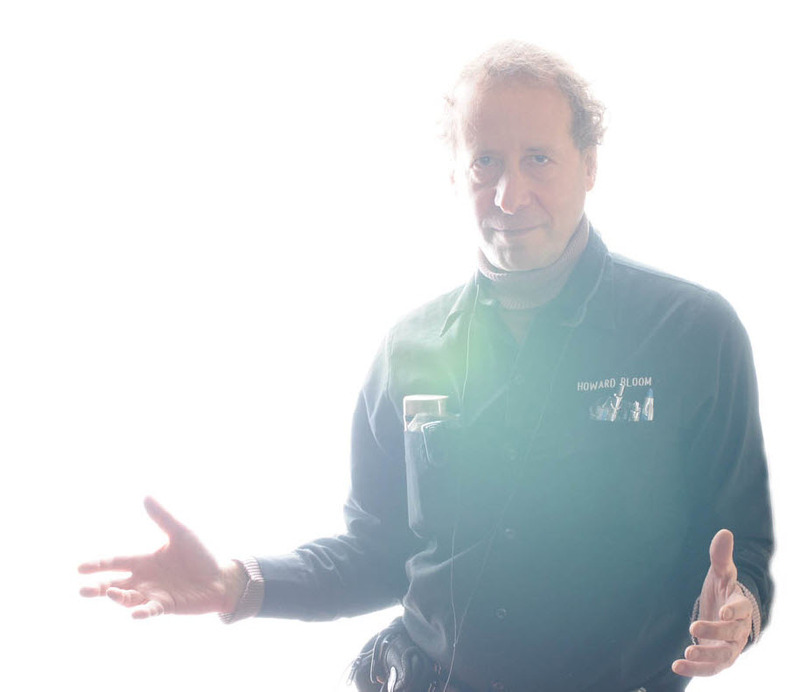 They championed a program started by former NASA head Michael Griffin to buy access to space and to the International Space Station from entrepreneurs. Griffin had created the Commercial Cargo and the Commercial Crew programs, programs that abandoned cost-plus purchasing and paid a flat price. Just as you pay a flat price for a train ticket. Commercial Crew and Commercial Cargo were the programs to which Barack Obama in April 2010 tried to direct six billion dollars. The backers of the SMIC blocked him. They did everything in their power to kill or clip the wings of these commercial programs. And they succeeded. They whittled six billion down to a few hundred million per year. Despite this, nineteen companies competed for the Commercial Cargo contract. Two companies won. One was the sort of entrepreneur some of the backers of the Commercial Cargo program had hoped for: Elon Musk’s SpaceX. But the other was not really an outsider. It was Orbital Sciences, a trusted member of the Space Military Industrial Complex. Orbital Sciences makes interceptor boosters for missile defense systems, boasts of nearly 50 major launches for the U.S. Missile Defense Agency (MDA), the Air Force, the Army and Navy, produces satellites for national security space programs, and proclaims that just one of its rockets, the Minotaur I, has launched a total of 62 satellites. Orbital Sciences also has an admirable track record of launches for the commercial sector and for NASA’s space sciences programs. But on top of its military space industrial complex status, Orbital Sciences has two additional problems. Before Tuesday’s explosion, it had three failures on flights carrying expensive payloads. And it has a nasty habit of building its rockets around old rocket engines like 1980s Peacekeeper Missile solid rocket stages and refurbished Russian engines built for the Soviet Moon program in the 1960s and 1970s. The space military industrial complex’s Senatorial and Congressional allies spotted a poacher on their turf in SpaceX. They sharpened their knives and tried everything in their power to hobble Musk’s company. For example, in June 2014 three Congressmen–Mike Coffman, Cory Gardner and Mo Brooks—demanded that NASA’s head, Charles Bolden, submit SpaceX to a slanted scrutiny that would give a false impression that SpaceX vehicles are unsafe. In other words, the space military industrial complex cabal wanted to tangle SpaceX in the sort of red tape that makes space military industrial complex projects so expensive. But that’s not all. Elon Musk had developed new rocket engines with new capabilities. Engines that are safer and cost far less than any that have come before them. But to fatten their profit, companies like Boeing, Lockheed Martin, and the company they jointly co-own, United Launch Alliance, stopped developing new engines. Instead, like Orbital Sciences, they bought old pre-1989 rocket engines from the Russians and refurbished them. It was an antique Russian rocket engine of this kind that apparently did in the Antares over Wallops Island. Where does the crash of SpaceShipTwo come into all of this? SpaceShipTwo was manufactured by a company called Scaled Composites. Scaled Composites is best known for SpaceShipOne, the craft that completed the first private space flight in 2004 and won the X-Prize. The company was founded by an audacious and brilliant aircraft designer, Burt Rutan. And Scaled Composites’ SpaceShipOne was funded by a silicon era entrepreneur, Paul Allen, co-founder of Microsoft. But in 2007, Scaled Composites was acquired by Northrup-Grumman, one of the biggest companies in the space military industrial complex. The space military industrial complex will try to pin the Orbital Sciences and SpaceShipTwo accidents on the commercial crew and cargo programs. They will try to fool you into thinking that we must retreat from “untried and untested” entrepreneurial firms. Only the SMIC, they will try to tell you, can make safe space vehicles. Don’t let them pull the wool over your eyes. It’s the space military complex that has made these two mishaps. The Lockheed-Martin F-35 fighter, a plane that some say could not win a dogfight with a 1951 Russian MIG jet. Each F-35 costs roughly $180 million. An outrageous price. And dangerous. If you can’t afford enough weapons to replace those that are shot down, you can’t win a war. The total F-35 program, some estimate, will cost a trillion dollars. That’s one-seventeenth of America’s entire annual gross domestic product. And the Global Hawk, an autonomous surveillance plane that flies 20,000 feet lower, yes lower, than the U-2 spy plane it replaces, thus making it far easier to shoot out of the sky. The Global Hawk carries only one-half the payload of sensors of the U-2. And it’s said that the Global Hawk can only be flown in good weather. How can you win a war if you are grounded every time there’s a storm? Eisenhower’s intuition was on target. America’s space military industrial complex has become a Stalinist merger of government and industry, a merger that has paralyzed us. And if we ever get into a war with a major power like China, our space military industrial complex and its hallelujah chorus in Congress and the Senate could be the reason we lose. So there’s much more meaning to the Antares rocket explosion and the downing of SpaceShipTwo than meets the eye.